Representing the Varsity Jaguars were, front row (from left): Nick Denn (Archbold), Jax the Jaguar (Joel Reinking, Wauseon), Austin Double (Wauseon), Jason Pfund (Wauseon), Brad Damman (Wauseon). Back row: Chad Kutzli (Wauseon), Nick Weigand (Archbold), Tim Rettig (Archbold), Dakota Hamrick (Swanton), Shawn Summers (Wauseon), Nathan Schaefer (Archbold), and coach Troy Double. 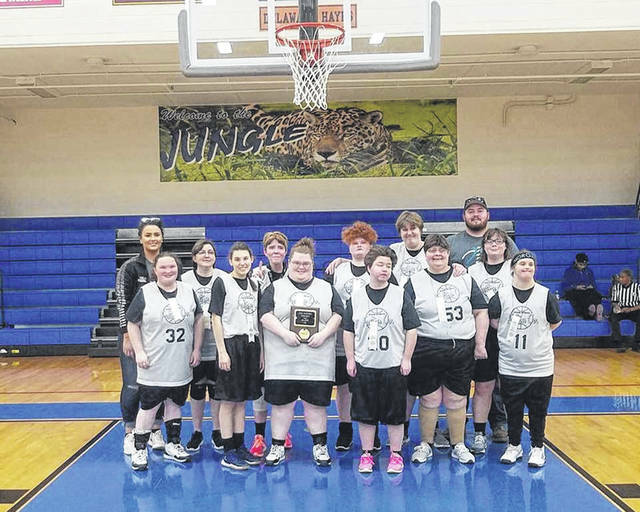 Participating for the Lady Jaguars were, front row (from left): Mary Delphous (Wauseon), Ana Holz (Wauseon), Jenny Whaley (Delta), Danni Smith (Wauseon), Ann Schroeder (Archbold) and Morgan Wagner (Fayette). Back row: coach Celia Wilson, Danelle Bodette (Archbold), Megan Marini (Archbold), MayLynn Sterrett (Swanton), Mary Cole (Swanton), coach Nick Wilson, and Keerston Volkman (Delta). 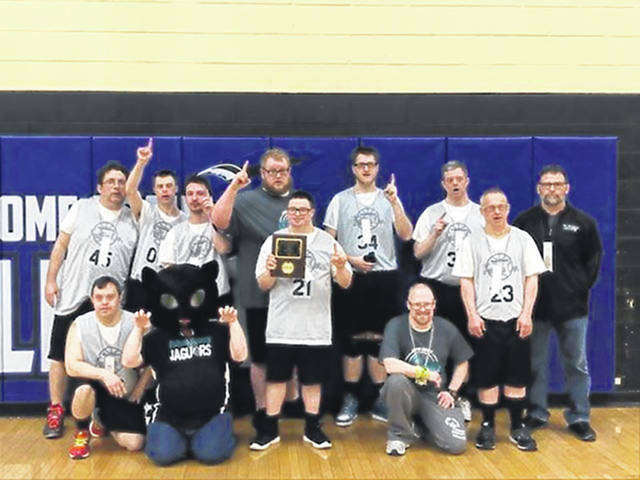 The Fulton County Special Olympics traveled to Columbus the weekend of March 22-23 to participate in the Special Olympics Ohio State Basketball Tournament. Both teams made it to the semifinal game. The Varsity Jaguars played Friday night but lost a tough game 49-36. They played again Saturday morning for third place. The Jaguars lost 43-42 by way of a buzzer-beater three-pointer and ended up placing fourth in the state. The Lady Jaguars played Saturday morning against the Hilliard County Lady Bobcats. Despite giving it their all, the Lady Jaguars came up short with a final score of 28-21. They placed fourth as well.